These classes conducted a two-week field study on the island of Montserrat in January 2005. 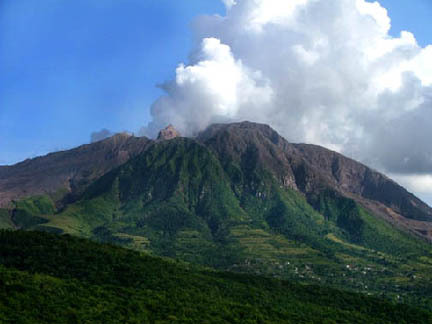 The island of Montserrat has three volcanic centers with one, the Soufriere Hills, currently in eruption. The island has suffered several major eruptions since 1996, including the last major activity in July 2003. The eruptions have left the southern part of the island devastated and resulted in the evacuation of Plymouth, the island’s former capital city. The economy has been destroyed and the population has dropped from twelve thousand in the 1990s to four thousand today as a result of emigration. Every year the rain brings down more debris from the mountain which creates continued havoc on the island and has affected the main tourist and agricultural area in the south. However, construction is booming on the island currently and new schools, a hospital, an airport, and government offices are now operating on the northwestern part of the island. People are learning to live with a live volcano. This program is an interdisciplinary blend of sociology and geology in which the students are researching individual and collective trauma and studying the geology of cataclysmic events. Students conducted oral histories, ethnographic research, and stratigraphical research on rocks from the Centre Hills, an older volcanic complex immediately north of the active volcano. They also toured the Montserrat Volcano Observatory to learn about volcano monitoring techniques and were able to see the devastation wrought by the volcano firsthand from the ground and from the air. Focusing on the geological and sociological aspects of the island and its community, this online resource center showcases student research on the following topics: Aging, Employment and Occupations, Gender, Housing, Infrastructure and Transportation, Youth, and the Stratigraphy of the northwestern Centre Hills. A note about copyright information: all photographs and information (unless otherwise noted) were taken and recorded by students or faculty members associated with the Disaster classes and are therefore copyrights of Dickinson College. If there are any questions concerning the use of pictures or information please contact Ben Edwards at edwardsb@dickinson.edu. This site was designed entirely by students of the Geology and Sociology of Disaster classes in the Spring of 2005; however, final internet preparations and design were completed by Alexander S. Lloyd and Ashley Haywood.